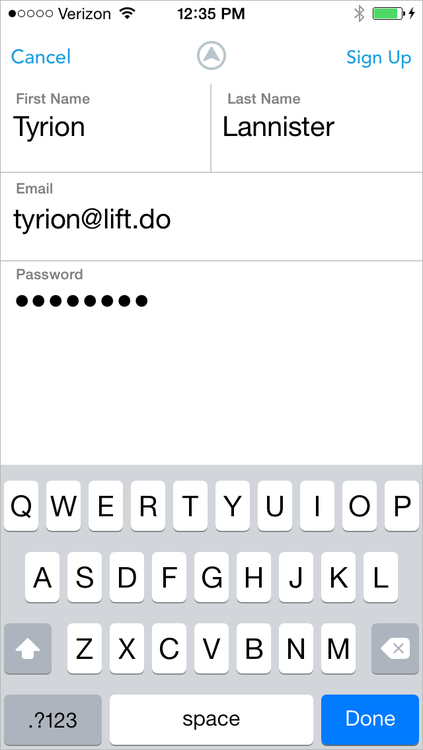 We’ll ask for your name, email, and password when you register for a Lift account. 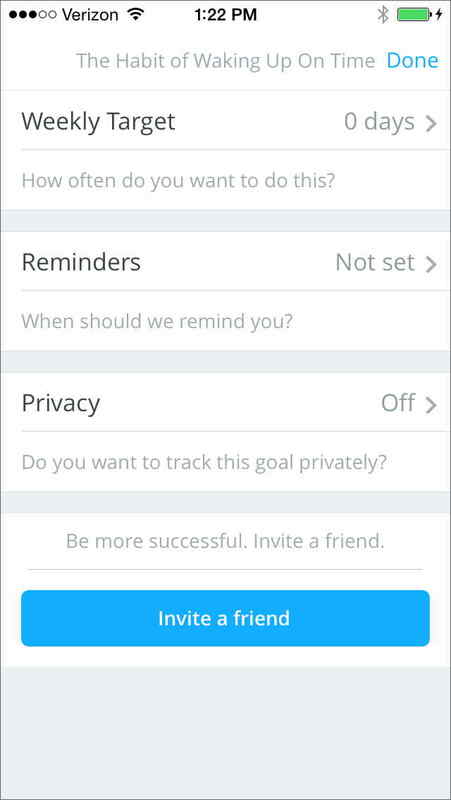 You’ll be able to set privacy on each individual goal; if you want to keep your account more private, use a pseudonym. Find friends on Lift by connecting to Twitter and Facebook, or by searching for them by name. 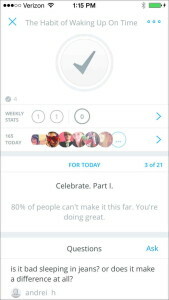 You and your friends will be able to see each other’s checkins to give props or add comments for encouragement. 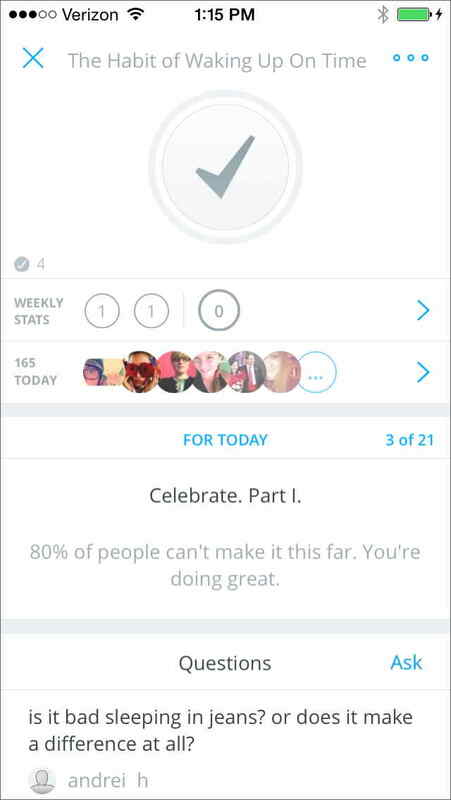 We recommend adding friends on Lift: it adds accountability and makes you twice as likely to check-in. 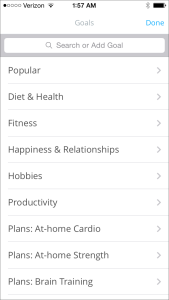 Then comes the fun part: choosing your goals.”Browse the categories to find a goal or habit that you’re interested in. Many of the plans you see include coaching. Plans with coaching have specific details about what to do for each day, and access to discussions for coaching and community support. 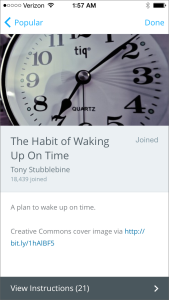 Here we’ll add a plan with coaching, “The Habit of Waking Up on Time”. It’s a great foundational habit to start with! Most people have some simple habits that they’d like to develop, and that don’t require any actual coaching. You can use Lift for those, too! 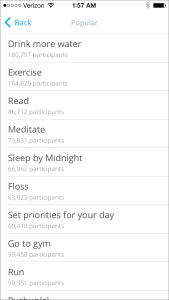 There are thousands of habits in Lift. 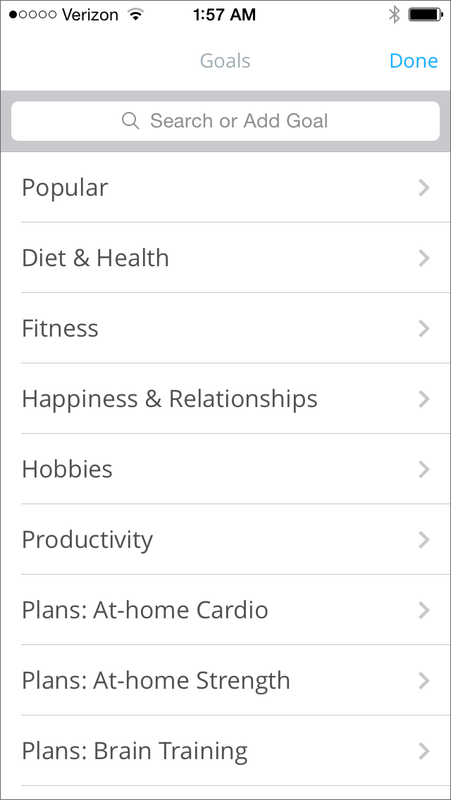 If you don’t see the one you’re looking for by browsing categories, try using search. 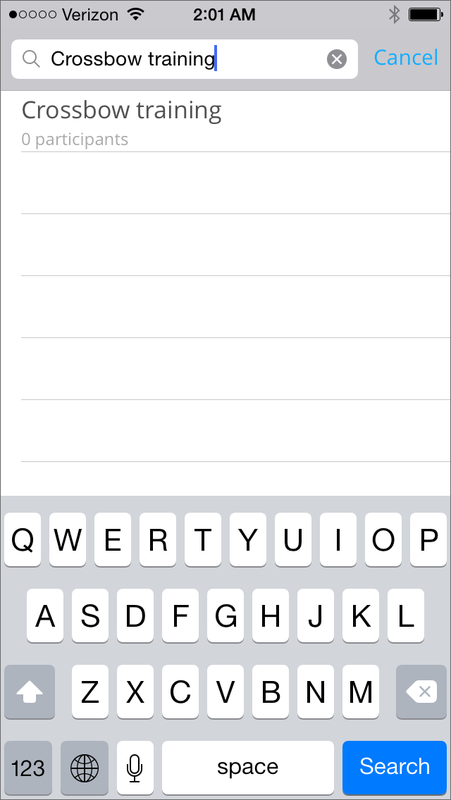 Tap the plus sign (+) at the top right of your dashboard. Type in the name of your goal and click search. 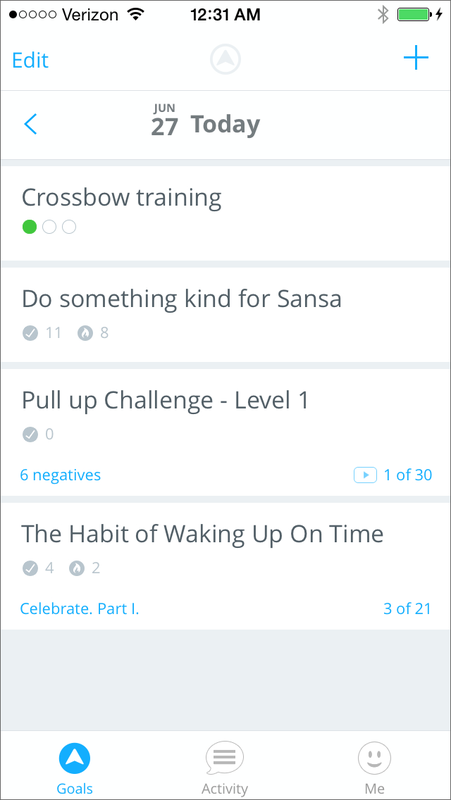 Hint: Try general terms first so you can see what goals and plans people have already added. IMPORTANT! Now tap “Join”. You need to join the habit you’ve just created! 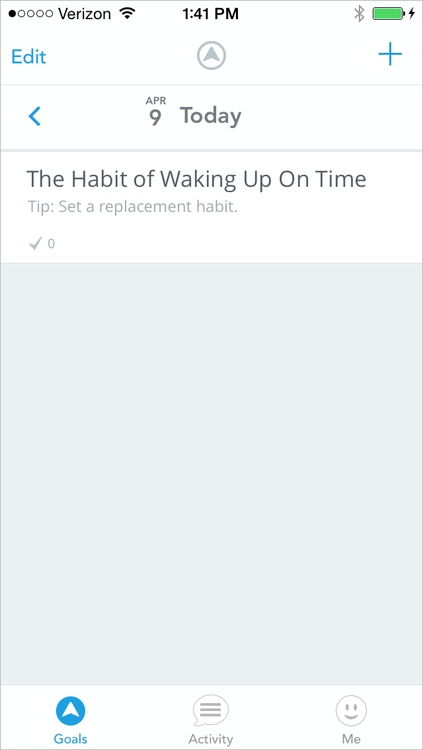 Once you’ve added habits, you’ll be taken to your dashboard. 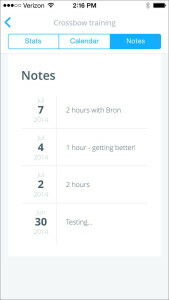 From your dashboard, you can check in each day to track your progress. Swipe to the right on an item to check-in quickly. 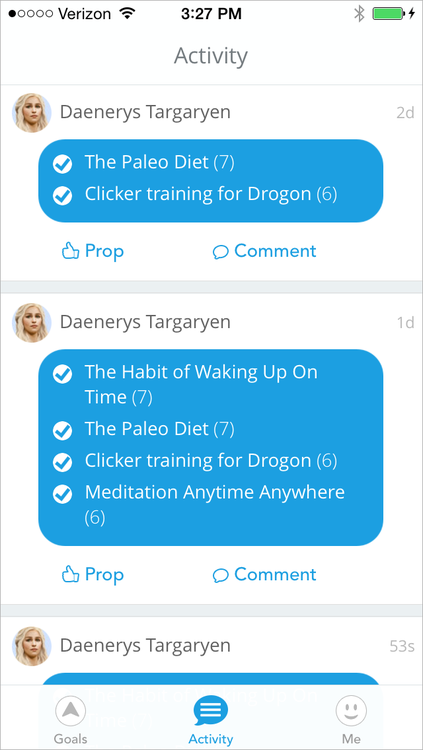 Tap on any goal for a detailed view with instructions, questions and answers, and the ability to skip steps, add reminders, or write a note. 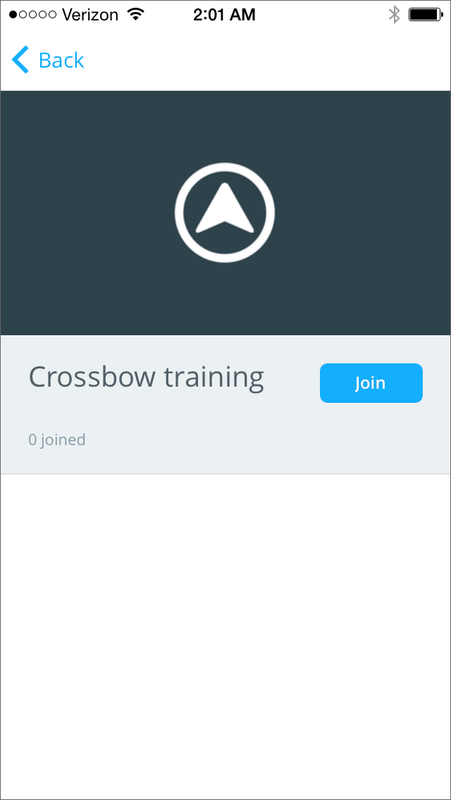 From this screen, check in by tapping the big checkmark button. It will turn green and you’ll be prompted to add a note, if you like: it’s optional. To delete a check-in, just press the green checkmark button again and it will turn back to white and remove the check-in. NOTE: Reversing a check-in will delete any data (props, notes, comments) associated with that check-in. You’ll also see the icons for other Lift users who have checked into the habit today. 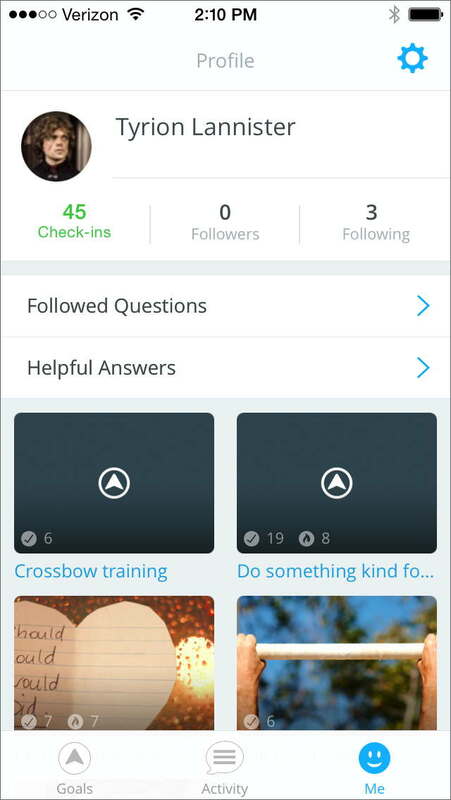 Tap the right-arrow next to the icons to view an activity feed of those users and give them props or comment on their check-ins. Connect with other users to enhance accountability and generate the power of community! Scroll down to view instructions (for plans) and Questions and Answers. You’ll see “Skip Step” on plans, but not on simple habits. 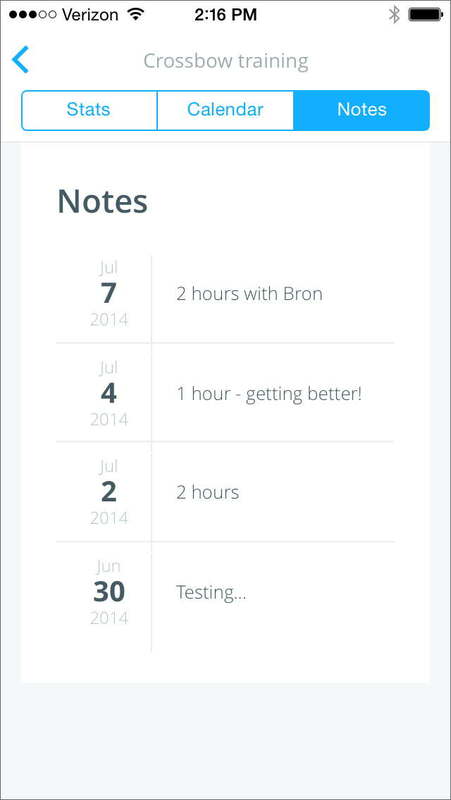 When you skip a step, the next step for the goal will appear for checkin today. “Skip” advances the plan to the next step. If you just want to skip a day of working on the plan, simply don’t check in: the current step will appear again tomorrow. 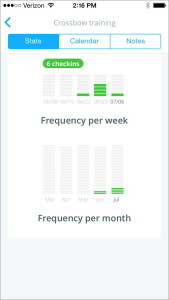 Weekly targets: set the number of times a week you’d like to complete the habit (the default is 7). Reminders: set an email or push notification to remind yourself to complete your habit as specific times and days. 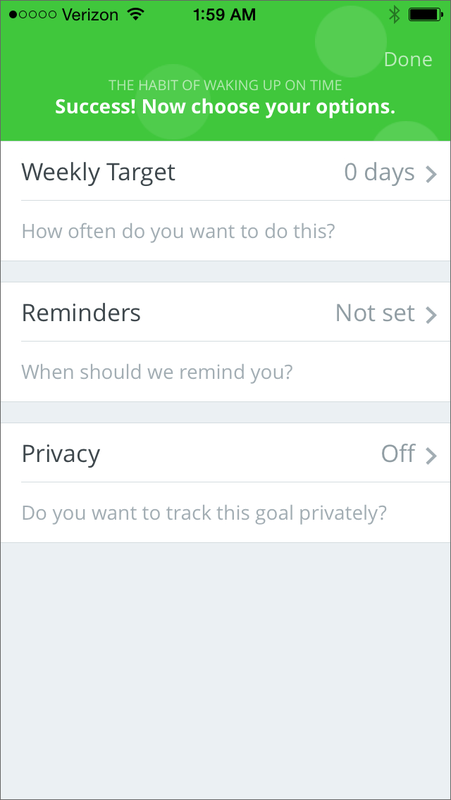 Don’t forget to look at your iPhone settings for the Lift app to enable push notifications for Lift. 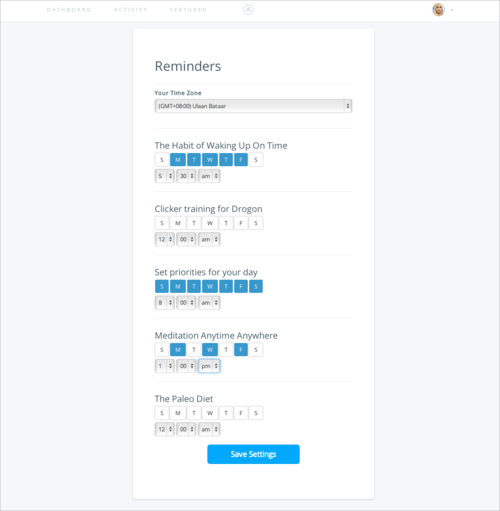 Not enabling push notifications for the app is the most common reason people don’t get reminders! 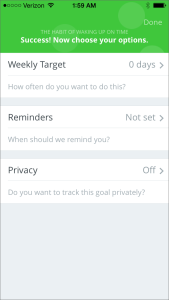 Privacy: you can set a habit to be private if you don’t want to disclose that you’re working on it. 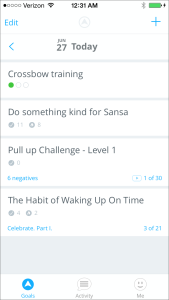 You won’t get props or comments on private goals, of course, so you’ll miss out on community support for those. Think about keeping your goals public if you can! You can also invite friends to join you in working on this goal. 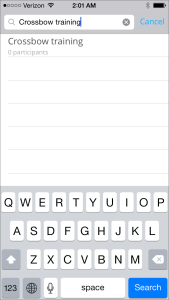 Once you’re finished, go back to your dashboard by tapping the “x” on the top left. 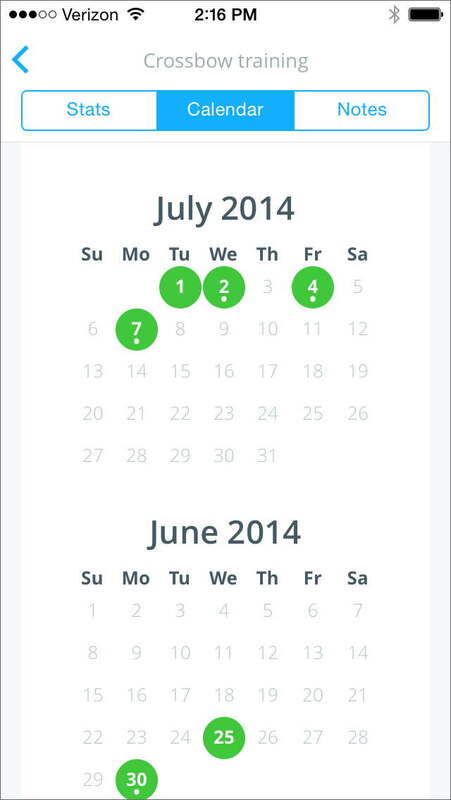 Back-dating: you can modify check-ins up to 7 days in the past. 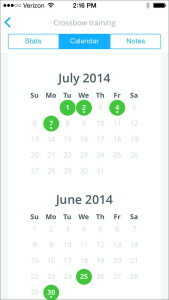 From the dashboard, tap the arrow next to the date to find the date you want to check-in for and follow the normal procedure for checking in. When you’re finished making changes, tap “Save” in the upper right corner (or “Cancel” to leave without saving change); you’ll come back to your profile page. Give people props or leave comments to encourage them on their progress with their own goals! 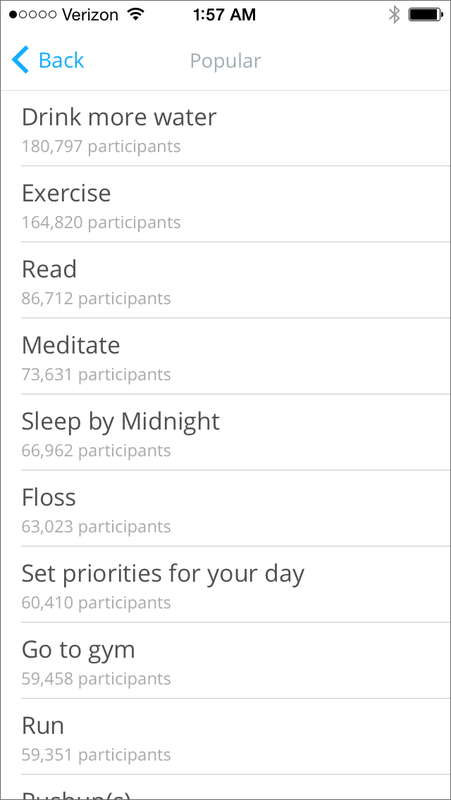 If you haven’t added friends, you’ll see a global activity feed of all Lift users. 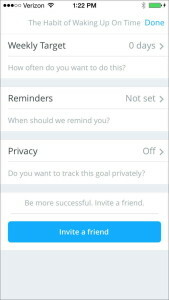 We recommend using the “Find Friend” feature on the settings page to customize your activity feed with people you know. 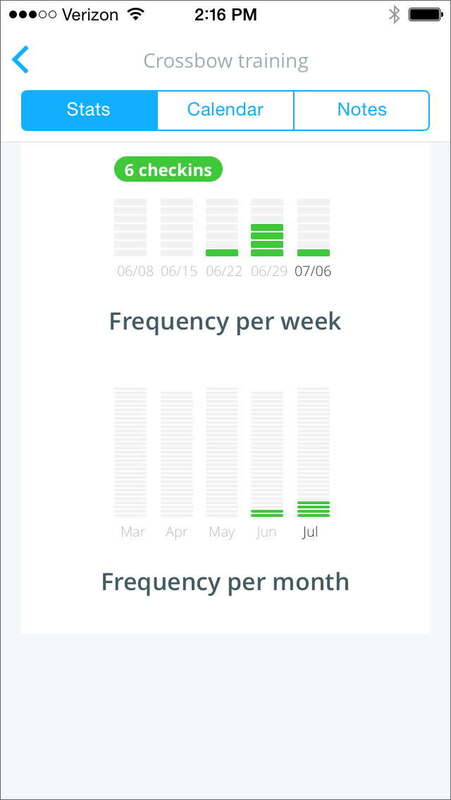 Adding friends on Lift makes you twice as likely to check-in! 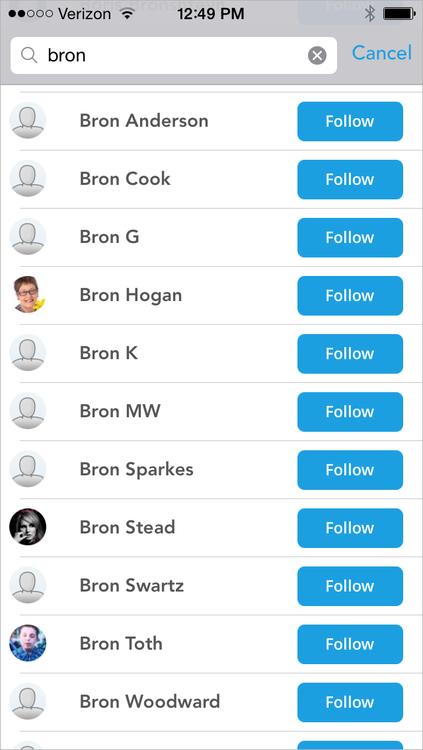 Find friends by connecting your Twitter or Facebook accounts, searching for their Lift usernames or Twitter handles (leave out the “@”), or inviting them by email. We’re a friendly group! Don’t be shy to prop or comment on check-ins or discussions of people you don’t know. Tap on anyone’s photo to visit their Lift profile and add them as a friend. Tap the Me tab to view your profile. 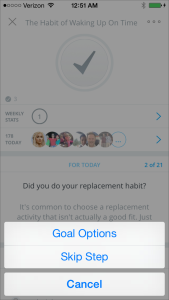 Click on the individual plan to see progress indicators for each goal.